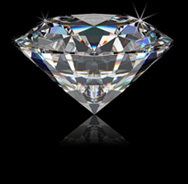 A carat is equivalent to one fifth of a gram (.007ounces) and is divided into 100 points. All other characteristics being equal, the larger the diamond, the more rare, the higher the price per carat. For example, a two carat diamond will cost far more than twice the price of a one carat diamond of the same quality. This chart illustrates how diamonds of different carat weights look in comparison to an average hand. This is for illustration purposes only. Once you have determined what cut, color, and clarity grade you are looking for in a diamond, it is easy to determine the carat weight of diamond that will fit within your budget. Our experts at Donald Haack Diamonds and Fine Gems can educate you in all the 4 C’s and help you make that all important choice in a quality diamond.